On Sunday I had V’s friends coming over for breakfast after their respective yoga class and I was wracking my brains to figure out what to serve. 1 hour of Yoga leaves one quite hungry. 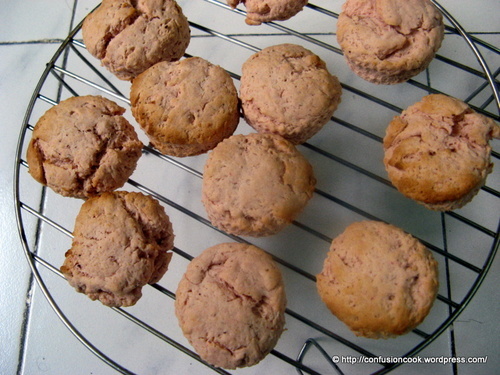 I wanted to prepare something filling and yet at the same time not the usual poha, idli stuff, then I remembered an eggless treacle scone recipe by Sarah of Baking and Life which I had shortlisted just last week. 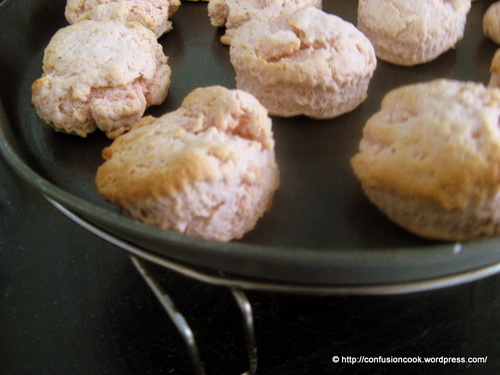 Scone is a small English quick bread of Scottish origin served with tea. Since I have not been able to buy my loaf tin yet, I jumped at the option of baking anything other than a cake. :) I made many changes in the original recipe to suit my needs & ingredients. The result was quite good & different. I would love to try them again with some more variation. Sift the flour & baking powder together 2-3 times in a bowl. Mix in sugar & cinnamon powder. Add the strawberry syrup & milk to knead the dough. Roll the dough about 2.5 inch thick & using a pastry cutter, cut into small rounds. 10-15 minutes until golden, then cool on a wire rack. Serve split in half and buttered. I have never tasted treacle syrup, so do not know how sweet it is, we all like our sugar on the lighter side & felt it to be perfect. So if you are one of those with real sweet tooth & do not have access to treacle syrup then you surely would need to increase the sugar to atleast 50 g.
* Self Raising Flour – Since it is an ingredient not commonly available in India, I googled a substitute for it and came up with option of making it myself on Chef in You. DK has given an exhaustive list with proportions for 1 cup flour, since I was using 2 cups I happily doubled it. Even when I was doing it, I felt there is something wrong here, I cant double salt in this. But I guess being a fool I am, I happily went ahead and doubled it, which made the scones slightly more on the salty side. Next time I would surely not double the salt blindly.